Uber is already stirring up plenty of controversy in New York, but this week the car service startup will be joined by Lyft, another San Francisco transplant with a similar service to offer. Unlike Uber, however, Lyft is going after underserved city-dwellers first, ignoring Manhattan to launch in Queens and Brooklyn instead. Bypassing the jam-packed island at the center of New York is an interesting strategy, and Lyft is painting itself as a bit of a savior for the outer boroughs. The company notes that 95 percent of taxi pickups in the city currently happen in Manhattan or at an airport. Many neighborhoods in Brooklyn and Queens don’t have easy subway access, and hailing a cab can be practically impossible. Like Uber, Lyft lets you hail a car and then pay for it using an app on your smartphone, but that may be where the similarities end. Lyft recruits everyday people to pick up passengers in their own cars, unlike Uber’s fleet of black vehicles. 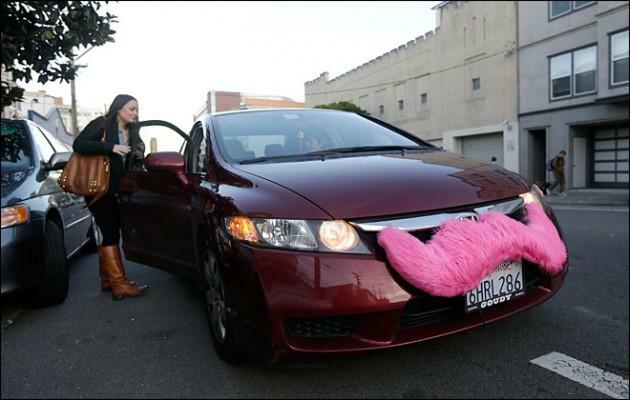 Each car also sports a big pink mustache on the front, making them easy to spot. If you’re in Brooklyn or Queens you can use Lyft starting on Friday at 7 p.m. The company’s also offering two weeks of free rides, so there’s no reason not to check out this new service at least once.